Planting conditions started off well and continued through to mid-October with little disruption. Rainfall around Thanksgiving weekend halted soybean harvest and subsequently winter wheat planting but once conditions dried up planting continued through to November. Approximately 906,000 acres of winter wheat were seeded which is slightly down from the previous year’s 910,000 acres. The proportion of hard red wheat (HRW) acres was consistent with the previous year’s crop at 7%. Soft white acreage dropped from 7% to 5% and the proportion of soft red wheat increased from 86% of the Ontario crop to 88%. Once again, the fall conditions provided an opportunity for wheat to become well established prior to winter. Throughout the months of January and February, there were notable freeze-thaw cycles causing concern about winter survival. Fortunately, winter wheat survival was good in many parts of the province. However, fields that were planted late or shallow or fields on heavy clay soils such as those in Lambton and Niagara counties, did have some heaving and winter survival issues (Figure 1). Reports of winter heaving also came from Bruce and Grey counties along with eastern Ontario. A number of those fields were replanted to corn or soybeans as a result. Overall, there were less than 500 damage reports primarily in Essex, Chatham-Kent, Perth, Niagara, and Bruce counties, which is on par with previous years. Figure 1. Freeze thaw events during the winter months resulted in heaving plants in this shallow planted winter wheat field on heavy clay ground. Plant stand counts were significantly reduced. Photo courtesy of Chad Anderson. Once again, fields that received a fall herbicide application were much cleaner than those that did not. Fields that did not receive a herbicide the previous fall were found to have flowering chickweed, large Canada fleabane rosettes as well as speedwell. It is estimated that less than 25% of winter wheat acres in the province receive a fall herbicide application. Growers are encouraged to consider a fall herbicide application as it provides clean fields in the spring and allows for proper fungicide timing when necessary. With a cool and wet spring, fields were slow to green up. It was challenging to access wet fields in April, so intentions to split nitrogen applications were adjusted to a single application on many acres. 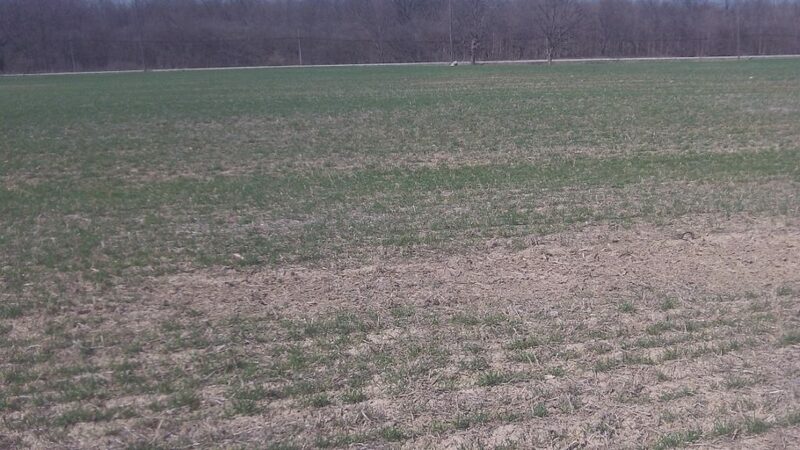 Visual differences could be seen throughout the entire growing season between early and late planted winter wheat. This was particularly evident in fields that did not receive an early application of nitrogen to promote tillering. In some cases, no nitrogen was applied until close to flag leaf emergence resulting in lost yield. Additionally, fields that did not receive a seed-placed starter fertilizer (phosphorus in particular) lagged behind fields that did receive seed-placed phosphorus. Mineralization of sulphur was slow and sulphur deficiency was evident in some fields, particularly those on sandy soils with low organic matter. However, many growers are now opting to apply 10-20 lbs of sulphur per acre to their winter wheat crop along with their nitrogen to alleviate any deficiencies. Very little disease was reported in winter wheat fields early in the growing season right through to the end of harvest. Septoria and powdery mildew were reported in some fields, but symptoms were generally well below thresholds. Stripe rust was also found in one field in the St Mary’s area in early June as well as a field near Clinton. However, the disease was not widespread and as temperatures began to increase into June, stripe rust became less of a concern. The low level of disease incidence resulted in many growers choosing not to apply early season fungicides. As conditions began to dry up in many parts of the province at the end of May and well into June, wheat began to burn up due to the lack of moisture. The dry weather was also accompanied with high temperatures which caused the winter wheat to progress through pollination much quicker than usual. This shortened the optimal timing window for fusarium fungicide applications (T3 timing). As a result, many growers chose not to apply a T3 fungicide particularly in Essex, Kent, Elgin and Middlesex counties. The high temperatures also resulted in fields exhibiting head snag (Figure 2); however, the yield impact was minimal. Figure 2. Severe head snag in winter wheat caused by high temperatures. Photo courtesy of Alex Zelem. Cereal leaf beetle (CLB) was reported at higher than normal levels in many locations this growing season. Growers are reminded that one CLB adult or larvae per stem warrants control after the boot stage but prior to heading. If significant feeding is taking place on the flag leaf in the early heading stages, control may be warranted. 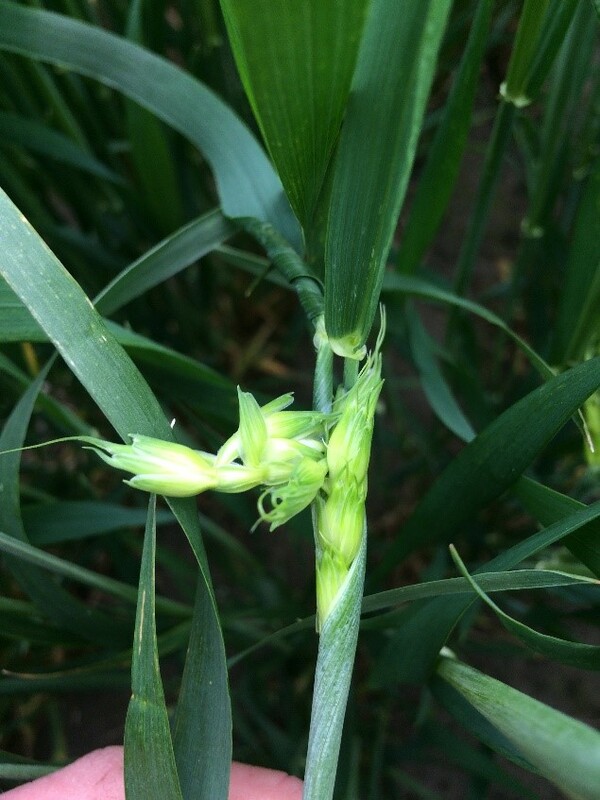 CLB moved into several spring cereal fields warranting control in many cases. For more information on controlling CLB refer to http://fieldcropnews.com/2016/05/stay-ahead-of-cereal-leaf-beetle/. A significant portion of spring cereals were planted by the end of April and planting was wrapped up by mid-May. Overall, spring cereals acres were down in 2018 likely due to challenging spring planting conditions and a significant amount of winter wheat acres in the ground. Despite the later planting dates for some the spring cereals, crops were off to a good start with adequate moisture. However, as the season progressed spring cereals began to exhibit signs of water and heat stress due to the lack of moisture and high temperatures during the months of June and July. Like winter wheat, diseases in spring cereals were minimal until August when crown rust was evident in many cover crop fields of oats. Early in the spring, the Environmental Protection Agency (EPA) in the United States established a maximum residue limit (MRL) on Manipulator, a plant growth regulator. As a result, many elevators no longer require growers to make a declaration of its use. However, growers should continue to work closely with their elevators to ensure there are no issues with using the product on their crop going forward. Winter wheat harvest started out approximately 7-10 days earlier than harvest last year. However, as harvest progressed wet weather did delay harvest across eastern parts of the province. Harvest was wrapped up for most of the province by the second week of August. Despite the relatively dry and hot weather during pollination through to the grain fill period and some challenges with a wet harvest, winter wheat yields exceeded expectations for many. The average winter wheat yield for soft red wheat was 85 bu/ac, hard red was 79 bu/ac and soft white wheat was 81 bu/ac. Areas that did not receive timely rainfalls such as Bruce, Grey and parts of Essex counties reported yields as low as 30 bu/ac. Spring cereals did not fare as well as winter wheat. A delay in planting, hot and dry weather from planting through to pollination, as well CLB pressure had a significant impact on spring cereal yields this year. Spring wheat yielded 90% of the average at 50 bu/ac, mixed grain was 57 bu/ac, oats yielded 86% of the average at 74 bu/ac and barley yielded 87% of the average at 55 bu/ac. The quality of the winter wheat crop was excellent with 92% of the crop grading a grade 2 or better. Kernel size was small, but test weights remained high. Elevators and millers reported high falling numbers and very low fusarium/DON in winter wheat. Where harvest was delayed due to rainfall, fields began to sprout, particularly soft white wheat fields. There were also reports of mildew and black point, particularly in Niagara County; however, this was not widespread. DON levels were slightly higher in some fields that received continuous rainfall but were still at acceptable levels. Straw yields were generally good and cover crop acreage planted after wheat continues to grow. Growers continue to frost seed red clover whenever the conditions are right. Where frost seeding was not possible, clover was applied during a window in the last week of April to the first week of May. Approximately 10% of winter wheat acres in Ontario were insured for underseeding of red clover. If growers were not able to get their red clover underseeded they opted to apply a cover crop such as oats, oats/peas, oats/radish or other mixes after winter wheat was harvested. Cover crops following winter wheat were planted relatively early followed by rainfall. As a result, many growers saw thick stands. For some, this resulted in high levels of crown rust in their oat cover crop. Growers are encouraged to select varieties that have resistance to crown rust to reduce the amount of inoculum being built up for future years. The cool, wet spring resulted in delayed soybean planting for many producers. This ultimately had an impact on winter wheat planting this fall as soybean harvest was also delayed. Growers who opted for early maturing soybeans were able to get their soybean crop off and plant their winter wheat in ideal conditions at the end of September. Several acres were also planted after edible beans. Wet conditions right through to the end of October resulted in a significant amount of winter wheat being planted from mid to late October. Despite the challenges with a late planting approximately (925,000) acres of winter wheat have been seeded. The proportion of hard red wheat acres is consistent with the previous year’s crop at 7%. Soft white wheat acreage dropped from 5% to 4% and the proportion of soft red wheat acres increased slightly from 88% last year to 89% this year. Due to the later planting and cool, wet fall conditions a significant amount of winter wheat has not yet emerged. Vernalization should not be a concern in those fields as adequate soil moisture would have allowed for the seed to absorb the necessary amount of water needed to trigger germination and vernalization. However, it will be important for growers to walk these fields early in the spring to monitor for growth. It will also be important for these fields to have timely nitrogen applications next spring to promote tillering. For more information on assessing winter wheat stands in the spring and early season nitrogen management refer to FieldCropNews.com.